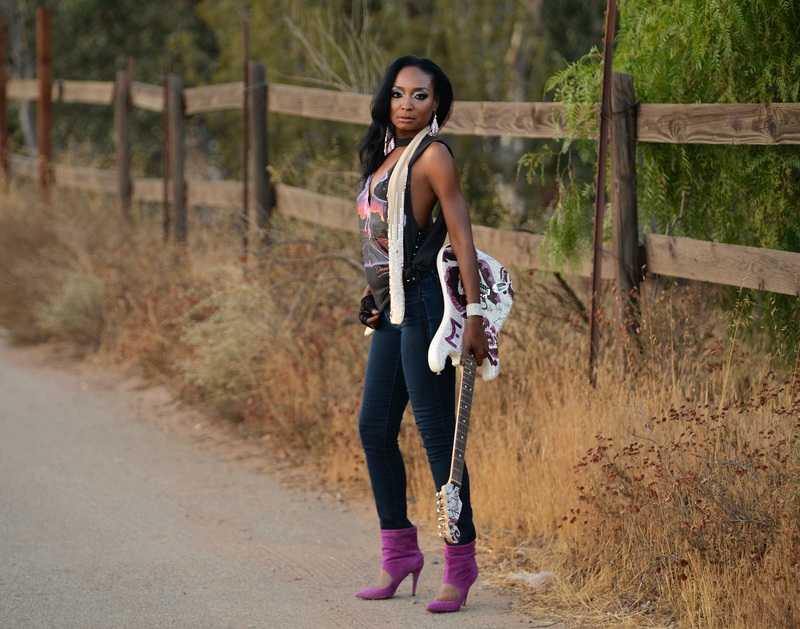 With over seventy million views on social media, having received accolades from Guitar World, Billboard, and some of the biggest names in the music industry, International, award-winning singer, songwriter, guitarist Malina Moye has created a unique brand and her Hendrix’ish type of music. Malina was the first female to participate in the Experience Hendrix Tour. Melina released an EP called Bad As I Wanna Be via WCE Records this past March that charted #1 on Billboards Top Blues Albums for two weeks. I recently spoke to Malina, and we discussed her career. At what age did you start playing the guitar? MM: My dad gave me my first guitar when I was nine. I’m naturally left handed so when he left the room, I took the right-handed guitar and flipped it upside down. And that worked! Who were your earlier influences? MM: My early influences were Prince and Eric Clapton. As I got older, I dove more into Stevie Ray Vaughan and Jimi Hendrix. Were you self-taught or did you have lessons? MM: I never took lessons per se. I grew up in a family of musicians and every day was a lesson. My dad is a bass player and plays a little guitar, so he showed me a few chords and off I went. I just kept surrounding myself with players better than me to learn from them. I still take that same approach. How did your endorsement with Fender come about? MM: Over a decade ago, the good folks at Fender heard about what I was doing and liked it. I love Fender and being a part of the fender family has been incredible. I think we fit together very well. Anything I can think of to help me express the voicing I’m looking for, Fender is up for the challenge and eager to help me find that sound. When writing, do you write the music or lyrics first? MM: Both. Mostly on this new album, I heard guitar riffs, and I would record them first. Then while I was driving, I would start hearing melodies and lyrics in my head, and THEN I wrote them down. However, on the song ‘Woman 2 Woman,’ the lyrics came to me first. What does your rig (touring and studio) consist of? MM: It’s pretty simple. I use a Fender Hot Rod DeVille 212 both in the studio and on tour. Although when we recorded songs like ‘A little Rough,’ we used Marshall JCM800’s because I wanted a specific 80’s tone. We had about eight of them brought in, and I played all of them to find that perfect one. I think each of those amps has different personalities. My pedals are simple: Boss Blues Driver, Boss Metal Zone, the original Jimmy Dunlop wah, reverb from the amp and the rest is in the wrist (lol). Do you improvise while playing? MM: Yes, especially if we’re jamming on something, which is when the best creative ideas happen. When it’s a well-known solo, it’s best to play a lick for lick. With all of your success, do you feel that you’re a role model for younger women who want to become a musician? MM: Thank you. I feel success is whatever you think it is. I hope that if I am a role model, a younger woman is learning to set her boundaries and keep her integrity. Also, to demand excellence in yourself and others around you is essential. And always leave the situation better than how you found it. Because, yes, there will be other girls watching. You can hear some Hendrix in your playing. Do you agree with that? MM: Wow!! Thank you for the compliment. Jimi is the greatest guitarist of all time. I would say my goal is always to push the boundaries on my feel, tone, phrasing, voicing, and the freedom in playing. And if you hear Hendrix in my playing, I think that’s probably why—freedom and self-discovery is everything. We all study the artists we love, and the goal is to expand our pallet as players, so thank you so much! What are your plans for 2019 that you can tell us? MM: I’m excited about continuing to tour in support of my first number one album ‘Bad As I Wanna Be.’ See what I did there, I love saying “number one” (lol). Also, I’d like to work on more feature films. I’m excited about 2019, and I look forward to seeing everyone soon.